Bhutan may appear dreamy and mystical, with its Himalayan beauty and monasteries clinging to mountain cliffs like swallows' nests. But the last Shangri-la, which until 50 years ago was a secluded, almost inaccessible spot on the map, now has its share of modern problems. Maybe it was its distinctive unworldliness that attracted me to Bhutan in the first place. I wanted to see for myself if the stories about its lofty natural beauty and its devout king who loves people were still true. Travel books suggested March to May - and also September to November - as the best time to visit the country. However, along with my travel companion from Singapore, I choose July, the middle of the monsoon season, which usually lasts from June to August. The good thing about this time of the year is that hotels are half-empty and you do not bump into fellow countrymen at every prayer wheel. But the downside becomes evident just one day after our arrival, when we travel from the capital Thimphu to Punakha, which until 1955 was the seat of the government. Heavy rainfall in the night has turned a little roadside creek into a torrent blocking our road, the most important connection between eastern and western Bhutan, with mud and rubble. "That will take a while to clear," says our driver Sonam, switching on the radio. He had generously allocated a journey time of three hours for the 80km to Punakha. In the end, it takes almost six hours to get there. On the way, British musician Ed Sheeran sings Castle On The Hill. As we approach the former capital, the late afternoon sun lights up Punakha Dzong, diffusing the leaden monsoon-greyness. In Bhutan, there are about 2,000 of these fortress-monasteries and the one in Punakha, at the confluence of the Pochhu and Mochhu rivers, is considered one of the most beautiful. Since the 17th century, the embalmed body of Bhutan's founder Zhabdrung Ngawang Namgyel has been enshrined in the dzong's holiest temple. His death was kept a secret from friend and foe for more than 40 years. It was here that Bhutan's first king was crowned in 1907. It was also here that the Governor of Trongsa rubbed a handful of dough into the face of British envoy Ashley Eden, who had come to Bhutan in 1863 to negotiate a solution over ongoing land disputes. The degrading treatment led to war between the two countries. The place is steeped in history. Only the two national carriers - Drukair (www.drukair.com.bt) and Bhutan Airlines (www.bhutanairlines.bt) - fly to Bhutan's international airport in the Paro valley (altitude 2,200m) from a number of cities including Singapore, Bangkok, Kathmandu, Mumbai and New Delhi. 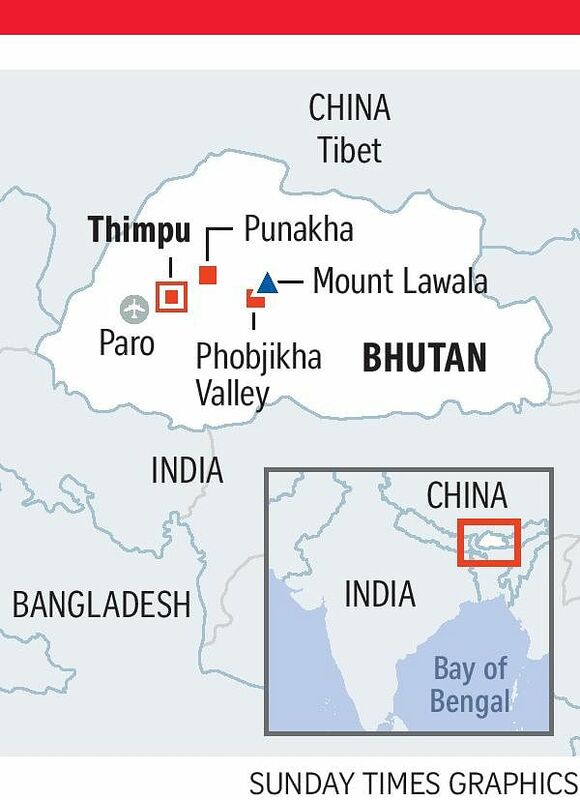 There are only about a dozen pilots with the licence to land at Paro airport, which is surrounded by high mountains. •Festivals - or tsechus - are held in all districts on auspicious days and months in the Bhutanese calendar. Lasting up to four days, a series of highly stylised masked dance rituals is performed at each festival. Paro and Thimphu festivals are the most popular in Bhutan. •Chela La Pass is the highest road in Bhutan that can be used by vehicles, with an altitude of 3,988m. It is 37km from Paro. Weather permitting, you will have a great view of the surrounding Himalayan mountain ranges. •There are a number of trekking options in Bhutan. The Snowman Trek is one of the toughest in the world, taking approximately 25 days. The recommended season for this trek is mid-June to mid-October. For those who prefer a more leisurely pace, the Bumthang Cultural Trek through the cultural heartland of Bhutan may be a better option. This is a fairly easy, three-day trek that takes you through beautiful valleys and along clear, trout-filled rivers. Go to www.tourism.gov.bt/activities/trek for details of treks. •Vendors from throughout the region start arriving on Thursday for Thimphu's weekend market and remain until Sunday night. You can combine a visit to the Bhutanese capital with some souvenir-shopping in the nearby Handicrafts Market. •The Black-Necked Crane Information Centre in Phobjikha Valley has informative displays about the birds and the valley environment. •Travel bookings have to be made through registered tour operators. They also take care of visa processing. Depending on the time of the year, the daily fee for each visitor ranges from US$200 to US$250 (S$270 to S$340) and includes three-star accommodation, all meals, a licensed tour guide and internal transport (excluding domestic flights). For a premium, you can opt for accommodation of a higher standard. For more information, go to www.tourism.gov.bt. An uninvitingly steep staircase leads to the temple complex, which time seems to have forgotten. The third courtyard at the southern end of the dzong boasts the architectural masterpiece of the fortress, the 100-pillar assembly hall. The focus of the hall is a trio of golden statues of Buddha, Bhutan's founder Zhabdrung and lotus flower saint Guru Rinpoche who introduced Buddha's teachings to the Bhutanese people. Even his birth - he rose as an eight-year-old child out of a lotus flower - must have caused a stir. There is hardly a place in the country where the Lotus-Born did not leave his hand or foot print on a rock. We arrive at the hotel in the dark. It is not until the following morning that the verdant terraced paddy fields loom in front of our windows. It is as if giants have hacked a staircase into the slope sprawling down to the river. Under the foggy clouds, we can spot a temple on a hill, on which childless couples have pinned their hopes for centuries. Starting in Sopsokha, a village at the foot of the hill where images of scarily large phalluses greet visitors from house walls, a path leads up to the temple of Chimi Lhakhang. In the 15th century, the holy place was the stage of a memorable battle between good and evil. 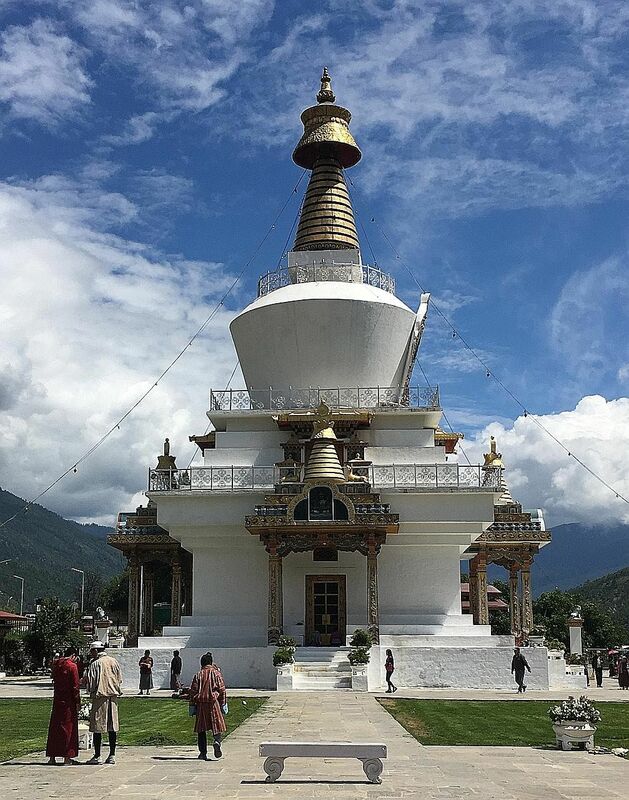 Legend has it that it was here, where the temple was built in 1499, that Drukpa Kunley, the most potent member in the Buddhist Olympus, brought a demoness to her knees with his Flaming Thunderbolt of Wisdom. Ever since, the phallus has been considered an effective weapon against evil spirits while Chimi Lhakhang, also known as the Fertility Temple, became a site where wishes for a child can be fulfilled. According to tradition, the monk on duty strikes pilgrims on the head with Drukpa Kunley's original bow and arrow and a 25cm-long wooden phallus. It does not hurt to additionally spray holy water on their faces, put some money into the donation bowl and spin the prayer wheels. "Nowadays, many childless couples from overseas come for the blessing," our tour guide Jamyang tells us. "The magic is working." Our next destination is Phobjikha, 190km to the south-east. The landscape changes with every kilometre travelled: the thickly forested valleys grow narrower, the rivers wilder and, behind each bend, the road has a surprise in store. Sometimes, a rowdy mountain god has hurled down boulders or cows, again, suddenly appearing out of nowhere block the lane. Sonam manoeuvres his Hyundai around all obstacles and along the steepest abysses, even when faced with oncoming traffic. In Bhutan, nobody uses a seatbelt. For Bhutanese drivers, the strap, which in other countries is praised for its life-saving properties, serves more ornamental purposes. "People are afraid they will be trapped in the event of an accident and won't be able to get out of the car fast enough," Sonam explains his countrymen's aversion to the seatbelt when suddenly a langur appears between the trees. "That's lucky," Sonam says and steps on the accelerator. The road winds through thick fog up to the Lawala pass at 3,360m. On the other side - as if someone has lifted a veil - we suddenly get an unobstructed view of the Phobjikha Valley, 400m below. It is the valley of the Black-necked Cranes. Each October, hundreds of these endangered birds start out from Tibet to stay here over winter in these unique wetlands. On their arrival, the cranes first orbit the Gangtey Goenpa monastery at the north-eastern entrance to the valley thrice clockwise before they hover down onto the meadows. On their departure, they bid farewell the same way. Even though the high valley has to do without its birds of heaven in summer, it still carries a lot of appeal. Even in the rain. The next day, Jamyang and Sonam elaborate on that thought during an eight-hour hike - enough time to get familiar with all the local legends of the valley. In Bhutan's version of Romeo and Juliet, the youngling falls victim to a sorceress who rips out his heart. His lover then meditates for the next 12 years before she is mentally stable enough to take fatal revenge. A stupa overlooking the valley of the cranes marks the place of the showdown. There are more than 10,000 such shrines in the country and each tells its own story. We return to the Gakiling Guest House (e-mail gakiling17@gmail. com), overlooking the Phobjikha Valley, where we are booked in for the night. There is no sign of life - the whole valley has had a power cut. But the guesthouse is prepared for such situations and well equipped with candles and camping lights. So dinner becomes unexpectedly romantic. As a kind of compensation for the glacier-cold water for showering, the host puts a bowl of rice wine mixed with scrambled eggs on the table. After two or three glasses, we get used to this unusual blend. Alcohol, with or without eggs, is one of the main causes of the high number of fatal road accidents in Bhutan. Recently, King Jigme Khesar Namgyel Wangchuck described alcohol as "our biggest menace". But the attempt to raise awareness by prohibiting the sale of booze one day a week - Tuesday is Dry Day - does not have much of an impact. The ban on tobacco has not worked either. According to a World Health Organisation survey, the land of the Gross National Happiness index has the highest percentage of adolescent smokers in the South-east Asian region. With 12 per cent among its 13-to 17-year-olds smoking marijuana, Bhutan also tops the list of adolescent marijuana users. This is not such a surprise in a country where cannabis grows around almost every corner. An article in Bhutan's leading newspaper Kuensel recently suggested a tested formula to rein in youth increasingly getting out of hand: Teachers are not allowed to use the cane to discipline children, the author wrote, but parents have the choice to break that rule if deemed necessary. "Spare the rod and spoil the child," read his admonition. At the Tiger's Nest, 3,120m above sea level, the world is still intact. Strong walkers can reach the most famous monastery in the Himalayas in two or three hours. For Guru Rinpoche, the lotus flower saint, it was much easier when he came over from Tibet on a flying tiger to this rocky cliff 900m above the high valley of Paro to take on a demon. At the end of the 17th century, eight temples were built above the caves where he had meditated 900 years previously. They obviously do not follow the law of gravity. Halfway through, the exhausted hiker longs for a flying tiger or any other mythical monster that is able to take to the skies, but to no avail. The ordinary man has always been left to his own devices and a sweaty ascent. But those who endure the pain will be rewarded with breathtaking views of the monastery, which clings to the cliff high above the world. At times, it is hardly recognisable through the clouds of fog. Then again, it shines under the sun like a just completed painting. You do not have to be a Buddhist to feel awestruck by the sight. And until now, not too many travellers from Singapore have marvelled at this monastery or visited Bhutan at all. In July last year, just 121 Singaporeans arrived in Bhutan out of a total number of about 3,000 for the entire year. In total, 177,000 tourists visited the country last year, with almost two-thirds of them from India. Up to now, Bhutan, where according to the latest survey by the Centre for Bhutan Studies (www.grossnationalhappiness.com) 91 per cent of the people are happy, has retained its magic. But it is not a foregone conclusion that the country will master the balancing act between butter lamp and smartphone in the future. Today, the demons that roam its valleys will not be subdued as easily as the ones the sage with the Thunderbolt of Wisdom, Drukpa Kunley, once dealt with in his very unique manner. •Frank Stern is a German freelance travel writer based in Munich and Singapore who focuses on South-east Asia and the Pacific.